KANSAS CITY, Mo. 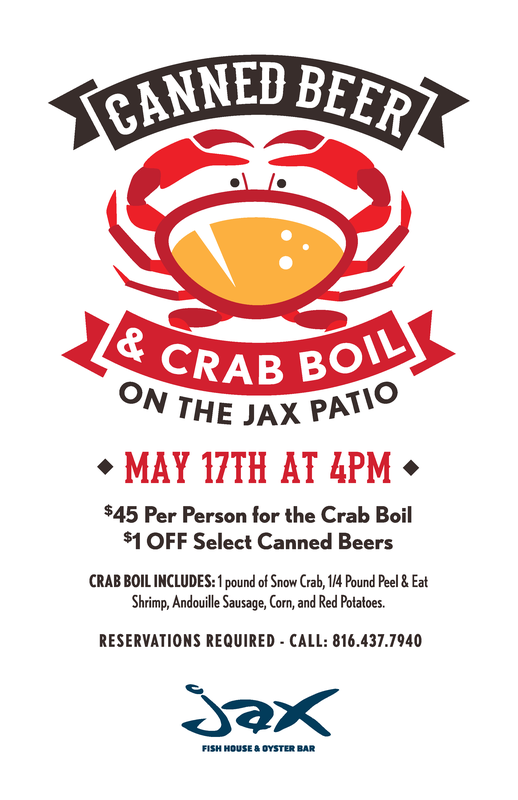 (May 11, 2016) Jax Fish House & Oyster Bar is kicking off the summer season with a Canned Beer and Crab Boil on its new patio on Tuesday, May 17 starting at 4 p.m. For $45 per person, guests can enjoy one pound of snow crab, 1/4 pound peel-and-eat shrimp, andouille sausage, corn and red potatoes. A selection of canned beers will also be $1 off during the event. In addition to the crab boil and beer specials, the happy hour menu will be available from 4-6 p.m. Reservations are required and patio seating is not guaranteed. To make a reservation, call 816-437-7940. About Jax Fish House & Oyster BarA Big Red F Restaurant Group restaurant, Jax Fish House & Oyster Bar brings the coasts to the coastless, serving up the finest and freshest the ocean has to offer. Sourcing dock-to-door, Executive Chef Sheila Lucero has built long-standing relationships with coastal fisherman to ship the highest quality seafood available daily, incorporating fresh ingredients into an innovative sea-to-table menu. Consistently voted to the “Best of” awards, Jax Fish House & Oyster Bar has five locations in Boulder, Denver, Fort Collins, Glendale, and Kansas City, each boasting unique menus. For more information, please visit www.jaxfishhouse.com.